Although he’s never shown any interest in forsaking his European roots, Olivier Assayas has the kind of career you might associate with a Hollywood journeyman. From sadomasochist thrillers (Boarding Gate) to literary period pieces (Les Destinées), he switches things up every time out. His last feature, 2008’s Summer Hours, got him long-overdue traction with the mainstream art house audience, so of course he’s followed it up with a five-and-a-half hour, three-part movie about the 1970s’ most notorious terrorist. Carlos, which will be exhibited in both its full-length version and an edited single serving (the 165-minute cut will also be available on demand beginning Oct. 20), tracks the career of Ilich Ramírez Sánchez, better known as Carlos The Jackal, a Venezuelan communist who learned his trade in the Popular Front For The Liberation Of Palestine. Beginning with assassination attempts on alleged Zionists and bombings of newspapers sympathetic to the Israeli occupation, he graduated to the big time with the 1975 raid on OPEC’s headquarters in Vienna, escaping by way of Algiers, Tripoli, and Baghdad. After his expulsion from the PFLP, Sánchez became a radical gun for hire, drifting between revolutionary movements and losing track of whatever ideals might have motivated him in the first place. The A.V. Club: You said at Cannes that Carlos isn’t a movie you wanted to make but one you had to make. Why? 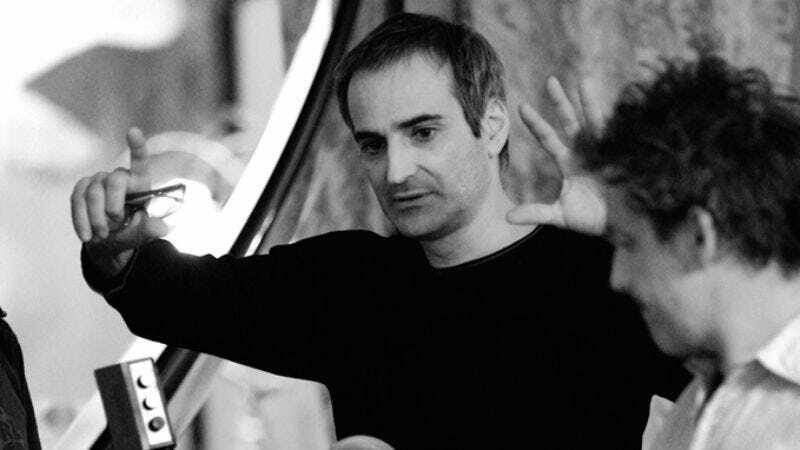 Olivier Assayas: I think it’s the whole process that became addictive. I think I was initially attracted to it basically in terms of writing. It’s the idea of writing a screenplay based on real life, and dealing with modern politics that felt exciting. I like the idea. I’ve never done it before. I knew there was a lot of material available. People had written books about the relation to Carlos. There was also a lot of stuff that had surfaced after the fall of the Berlin Wall, meaning Stasi or Hungarian state security files. I knew there was a lot of interesting material available, and it was kind of exciting, just in basic screenwriting terms, to try and make sense of it. I had no idea it would turn into this behemoth. To me it was just trying to capture it, and try to crack it really. AVC: The bigger it gets, the more it costs, the more people have to say “yes” to it. OA: Yes, of course, of course. But ultimately the fact that it grew was not a budget problem in itself. Ultimately, in terms of financing, we were talking TV logic. When your film becomes five and a half hours, it’s not like when you’re doing a regular film and this producer says, “Are you out of your mind? This is just simply not going to happen.” In the case of TV, they don’t say, “Oh this is a problem, because now we’re discussing three films.” The problem is just basically instead of green-lighting one TV movie, they’re green-lighting a TV movie divided in three parts. It’s all very scientific. They have that much money for one film, and then you just multiply it by three. It’s not like one film going crazily over budget. It’s just about, okay, green-lighting another film, and then green-lighting a third one. AVC: So when you’re shooting, are you taking into account that most people are going to see Carlos on television? OA: That was the downside. I knew, because of the financial structure of the film, it would have to be first on French TV. Somehow, I considered that I sacrificed the French release, because I knew that because the way the financing of the film was structured, this would have to be on French TV first and then in the theaters. I knew, in terms of the visibility of the film, in terms of the media reception, it would spoil the release. Also, because technically in France we were never allowed to release the full version, because it’s—I don’t know. You don’t want to hear about that stuff. In France, technically because it has been financed by Canal+, it’s not a film, so it’s not allowed to be in theaters. That’s it. Which was extraordinarily frustrating, of course, because the version that was shown in Cannes and that was championed by the French press was the full version, and it was not allowed to be on [a movie] screen. So forget about France. In all the other territories, it exists simultaneously on TV and in cinemas. But when we were shooting it, we were making a five-and-a-half-hour film. I don’t make a difference between this film and my other films. I shoot it exactly the same way, except eventually when I’m making this film, I have more money. I have a bigger budget. I can do it on a bigger scale than many of the films I’ve made. So, somehow, that makes it even more of a movie. AVC: The length gives you a lot of leeway in terms of pace. The OPEC raid that opens the second part is long enough to be a movie in itself. OA: Yes, it’s an hour and 20 minutes. But then it’s not the story of Carlos. That’s the difficulty of the project. The events leading to the Rue Toullier shootout are a movie in itself. The OPEC operation is a movie in itself. We had the material to make a movie around the arrest of Carlos in Sudan. The problem is that those segments don’t make sense. What makes sense is the whole arc of the story of Carlos. It’s in connection, one with the other. The key was being able to connect different moments in the career of Carlos, and how somehow there was something in the way he adapts to the changing times. Sometimes he makes his own fate, but sometimes he’s also made by his fate. So, sometimes he has control on what’s going on, and sometimes he has zero control. I think that also what was exciting was the fact that it gives you a notion of the fate of an individual. It’s how someone adapts to the changing times. How someone whose life is extraordinarily connected to modern history interacts with the ups and downs of the history of his time. And also how his world or his territory shrinks and shrinks and shrinks until he ends up an outcast in Sudan. AVC: It’s interesting to be immersed in the context of 1973 or 1978, and the rhetoric that’s used, the sense that so many people believed they were part of an international movement. There are political movements now, but I don’t think anybody thinks they’re involved in a global struggle for armed revolution. OA: No. At that time they were. Going back into it just reminded me how there was this notion at the time of some kind of global revolution. You had revolutionary movements loosely interconnected in all parts of the world, in Latin America, in Europe, in the U.S., in Japan. It was a period of political unrest that was defined by Marxist convictions, and by something that had to do with a simultaneous counterculture, a Marxist revolution. There was this notion that it was transnational. It was some kind of youth movement, and somehow you connected more easily with a radical from another country than with squares from your own culture. So there was something very strongly transnational, and somehow the story of Carlos embodies it. I didn’t realize it at first, but I think the reason why I ended up making this film and struggling to get it right is because it was such an important element of those times. Because Carlos speaks all those languages, because he’s just crazily transnational himself, being a Latin American who studied in Moscow, who became a Palestinian militant, active in Western Europe. Speaking all those different languages. He makes sense of the obsessions of those times, with global revolution, and he also makes sense of the connection between terrorism and geopolitics, which is the limit of most of the films that have been made about terrorism, in the sense that the Japanese made movies about Japanese terrorists, Germans made movies about the German terrorists, and the Italians made movies about the Italian terrorists. But ultimately, the limit of those films was that they just did not get the internationalism right. Ultimately, whatever what they were about was not connected to the local politics. That was the most common mistake. It was always connected to the broader scope of the Cold War. Again, Carlos is the central character of the late stage of the Cold War. AVC: The effects of globalization run through a lot of your films, from the dystopian thriller Demonlover to the more melancholy and naturalistic Summer Hours. Terrorism goes back at least to the 19th century, but the kind of international movement you’re talking about can only exist in a sense with a global media apparatus to support that sense of unity. OA: Yes, of course, that’s one of their concerns. But what was very interesting for me when I was writing the screenplay is how fluent I still was in the language of the 1970s. To me it was like a language I had forgotten, but somehow it just came to me naturally when I started writing it, when I had to make Eastern Europe apparatchik-speak, or the strategic discussion of leftist militants. It’s rhetoric that came back naturally because I grew up hearing that stuff. It’s words, notions, values that are long forgotten. But somehow I had the music of it in my ear. AVC: Were those political movements important to you at the time, personally? OA: Well, you could not escape it. When I was a teenager, you had to define yourself politically. Now it’s, I don’t know—it’s not exactly the same thing, not by far. At the time, when you were in high school or in your early teens, you had to define if you were with that group or that group, if you were a Trotskyist, or if you were a straightforward communist, if you had Maoist tendencies, or if you were a libertarian, or a combination of any of those factors. You could not get away from that. So yes, of course, I was involved in high-school politics. I read the press. The thing that was slightly different for me was that for some reason, I suppose which has to do with my love for music and art and so on and so forth, I was more influenced by American and English counterculture than by strict European leftist politics. The fact that somehow I kind of absorbed both cultures, and I suppose the countercultural values protected me from the most unbearable aspects of Euro leftism. [Laughs.] I didn’t realize it at the time, but the political debate in Europe in the ’60s, it came from ancient ages. It like from the 1920s or the 1930s. Are you a Stalinist? What kind of revolution do you stand for? People would be discussing obscure events of the Russian Revolution to figure out if the anarchists got it right, or if the Trotskyists got it right. The whole debate, and I’m talking about stuff that kids would be discussing, was from another time and place. Whereas the Woodstock nation, opening your mind, and Summer Of Love stuff—we make fun of it, but it was a tiny bit more in touch with the times and with how the world was changing. AVC: Through the course of the movie, Carlos loses touch with those ideals. He has that conversation at the beginning where he says that “every bullet will have an idea behind it,” but that seems to get lost later on. OA: Yes, that’s based on recollection of dialogues he had with that specific woman. I mean, that woman wrote—we’re not allowed to quote her and blah, blah, blah and so on and so forth, or mention her name. She wrote her memoir of her acquaintance with Carlos, and she transcribes different conversations she had with him, so that idea that comes straight from those. Most of the dialogue comes straight from those. AVC: One of the things that’s striking about the movie is, in a sense, how boring the life of an international terrorist can be. It’s a succession of cramped apartments and hotel rooms, another minor official taken hostage. It’s very isolated. The sense of being engaged in great struggle is more in their heads than in real life. OA: Carlos is not a big thinker. He’s a soldier. He’s a guy who does operations that have been designed by someone else. OA: Right. He’s an executor. He never really defined strategies for the Palestinian cause. While he was a member of the PFLP, he would do what Wadie Haddad asked him to do. And later, he only survived by being on the payroll of various secret services. So he was running operations that were commissioned by basically the states who employed him, serving the specific interests of those countries. He is not someone who has some kind of vision of international revolution, or a vision of what 1970s terrorism is about. He’s a guy who just does things, and who uses the rhetorics of the time to get his way: To manipulate people. To impose his power. So in that sense, the rhetorics are always fairly empty. When he has that scene in the restaurant at the beginning, I can accept there is a certain level of sincerity. He’s a Third World militant. He has big ideas, and so on and so forth. But they are kind of naïve. Gradually they grow thinner and thinner, and the rhetorics just become an excuse for acting in a brutal and cynical way. In the case of Carlos, again, it’s a smokescreen. But then, at the time, the political discussions—I don’t think [in the U.S.] there was the same sense of some sort of imminent revolution. But in Europe in the ’70s, it was defining. People were convinced that revolution was coming, and they were waiting for it. Basically, there was no question that it was going to happen. Of course it was going to happen. So the issue was what to do when the revolution happens. Are we going to build the Stalinist state? Or are we going to repeat the mistakes of the Russians? Or are we going to build a new utopia, built on freedom and blah blah blah? So people, they were living in Never Never Land. But still, they thought that these were actual problems that had to be addressed. So, they took their political positions and their rhetorics extremely seriously. AVC: I don’t think anyone wishes more people were blowing up airplanes with rocket launchers, but there’s something about the seriousness of that debate that’s appealing in a certain way. Now, most people just laugh at the idea of that kind of discussion. They just think a subject is ridiculous. OA: An immediate payoff. So they have become pragmatists instead of idealists. Which involves also considering you have no control on the politics, which kind of opens the way of modern forms of fascism. AVC: It’s a self-fulfilling prophecy. If you assume you have no control over politics, you don’t. OA: You give it away to the guys who really want to have control.